Special SF Spots – It’s Not Just About Real Estate! Where can you go in San Francisco to watch a sailboat race, walk a sandy trail along the water and grab a delicious caprese sandwich at the Beach Hut? If you guessed Crissy Field, you just guessed one of my favorite spots in the city and I did all of those things when I went for a walk there this past weekend. Ever since this area, which was a former Army airfield, was developed and opened to the public in 2001, I have gone there regularly. Whether to walk in contemplation or watch the tourists as they ride by on their rented bikes in their SF sweatshirts, it’s a perfect place to meditate or people watch. Starting from the Presidio Gate, walk down “Lover’s Lane” to its end, turn right and head toward the Palace of Fine Arts. This will put you at the beginning of the Crissy Field path along the water. If you are hungry like I was, you can stop first at the Beach Hut Café and have a cup of organic soup (carrot ginger) and half a sandwich (the caprese was delicious!) for $8.95, which is a pretty good buy, by SF standards. Walking along the water is rejuvenating and eventually on a weekend, you’ll smell the scent of barbecued food as you arrive at the grassy area with picnic tables close to the GG Bridge. There, people are allowed to hold parties and get-togethers. Several birthday parties were underway as I walked by. Beyond this area is a favorite café of mine – the Warming Hut – which serves assorted food and drink and sells a variety of wildlife books and children’s games. I bought my nephew an astronomy kit here awhile back which he loved. I’m always amazed when someone I meet who lives in the city tells me that they have never been to Crissy Field. It’s not to be missed by either a resident or a visitor. 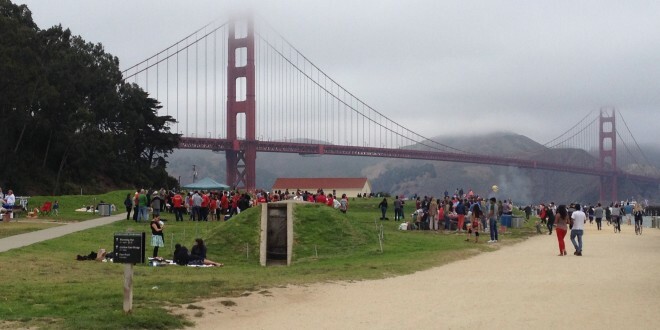 For more information about this special SF spot, go to http://www.presidio.gov/explore/Pages/crissy-field.aspx. Previous: Keeping Real Property Taxes Low!